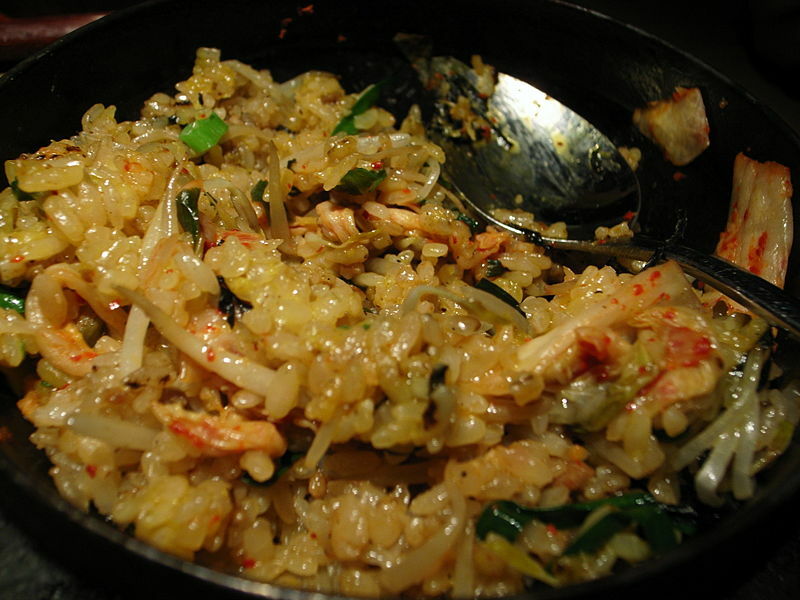 Kimchi bokkeumbap is a variety of bokkeumbap (fried rice dishes), a popular dish in South Korea. Its name literally translates as "Kimchi mixed rice". Kimchi bokkeumbap is made primarily with kimchi and rice, along with other available ingredients such as diced vegetables or meats. Leftover rice and/or over-ripened kimchi as ingredients are usually preferred in preparing kimchi bokkeumbap. Over-ripened kimchi can also be used for cooking kimchi jjigae. Indeed, well-fermented kimchi and chilled rice can produce a flavor of greater richness as opposed to freshly made kimchi and rice. Along with kimchi and rice, kimchi bokkeumbap can contain many kinds of ingredients. Pork is preferred, however, beef, chicken, bacon, ham, or spam can be used. Instead of meat, canned tuna, shrimp, or mushrooms can be used as a replacement. Meat ingredients are chopped into the dish together with vegetables such as onion, carrot or zucchini. A small amount of minced garlic and sliced green pepper can be used as seasoning. These ingredients are fried in a pan with a little vegetable or sesame oil. After the cooked dish is put on a plate or in a bowl, a fried egg is sometimes served on top. Thinly shredded gim, chopped scallions or sesame are spread over it to enhance the flavor and to garnish.